Was I really going to push my bicycle out of this living room tomorrow to go cycling for six months? In rural China? Wild camping? Yes, that’s exactly what I did the next morning and it was the journey of a lifetime. I’ve been on and off touring in Asia ever since. And if not, I try to host as many cyclists that come to my hometown as possible. It’s addictive. I’m still nervously excited before I go on a trip but much more relaxed about the preparations. As it helped me to read how others do it, I would like to give some advice with this article on how to decide what and how much to take, how to deal with certain situations on the road and so on. Before starting my first tour, I felt very uncertain on what to pack. I watched a lot of Youtube videos of other cyclists and read lists on what to pack for a tour. I bought an expensive stove as everyone said I needed it. I packed too many clothes. I packed tools I never used and still don’t know how to use just because I thought they were a “necessity”. So, if it’s your first trip, I suggest to listen to your guts in what you think you’ll need and remind yourself that many, many, many things can be bought easily while traveling in China. For more specific items that you don’t own yet and aren’t certain about needing it – like the stove in my case – you could get in touch with a hostel or bicycle store further down the road and check if it could be ordered for you to their place. If I had done that, it would have saved me not only the money but also a lot of nerves packing (small stove, bottle of fuel, pot and some utilities take up almost one pannier – I could have packed three bottles of shampoo instead!). Also, if you know people who have been bike touring before they might be able and willing to borrow things to you. If you are traveling with a partner or even in a group you can cut down on the things you need to take as you can share. But for me I would always have everything I need in an emergency on my bicycle. In Myanmar, cycling with a friend, he just zipped off, enjoying the down-hill even though the rain was pouring hard, when I discovered I had a flat tire. Even if we had phones and he would have heard it, and would have had to go all the way back up hill to help me out if the only flat-tire-kit would have been on his bike. Luckily by then I had already decided to have everything I need in this case or in an emergency case. I am still using the same four panniers I bought for my first trip. So far they have lasted for more than 10,000 km, seven or so international flights and being hit by a bus. I recommend to get waterproof ones that you can take on and off your bicycle with one hand (e.g. Ortlieb, Vaude, but by now there are more brands around). That way you never get into the situation where it starts raining heavily onto your bags while you are still pulling out the rain covers, getting wet yourself. 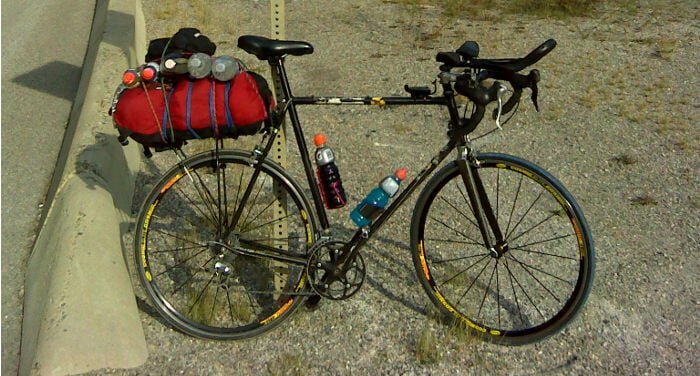 For handle bar bags I started with a cheap one – it broke just a few hundred km down the road. For the next trip, I had another cheap one I found in my basement. It lasted for a four-week trip in rainy Myanmar but I left it behind as it got moldy… Now my handle bar bag is a name-brand as well, which will last. Health is one of the most important issues. So on my first trip I brought loads of painkillers, band-aids, dressing material, anti-diarrhea tablets, antibiotics as tablets as well as cream, disinfectant for wounds and more. I would have liked to pack one of my back panniers only with these and shampoo. Plus some spare ones for the handle bar bag – just in case. But it’s not needed as it’s never a problem to find a pharmacy in China and stock up or get special medications. So now I only need what I would need immediately in an emergency, somewhere in the loneliness of some mountains. That’s painkillers, disinfectant for wounds, a bit of dressing material and anti-diaherea. If anything was used up, I would just go to the next pharmacy and the same goes in the case where I need any more specific medication. With my basic first aid kit have what I need to be able to get to the next pharmacy. For repairs on my first trip I took spare brake pads, spare batteries for the bicycle computer, a tool for the chain, a bike tool with different size screw drivers, a handful of patches, a pump, an adjustable spanner, gaffa tape, zip-ties, a spare tube and lube. Now it’s just the bike tool, patches, spare tube, gaffa, zip-ties and lube. That allows me to do everything that’s needed along the way as well a bit of maintenance (tightening screws and lubing the chain). Sleeping is the next most-important thing. On my first trip I actually thought about bringing extra clothes for the night. I have a tent; for China I think it’s very important that it’s a stand-alone-tent as many times I had to put it up on concrete and, apart from that, I just hate anchoring my tent. My sleeping mat then was a rather cheap one that took of the space of half a pannier – the other half was the sleeping bag that needed to be good for up to 0°C degrees. And instead of wearing a designated night-gown I just put on what ever seemed fit for the current temperature. The tent actually doesn’t go into one of the panniers but on top of the back rack. For clothes I follow the rule of three. Three items of everything is more than enough so I have “one to wear, one to wash, one to dry”. For ‘civilian’ clothes I have one short, one long pair of pants and a skirt as well as three undies and three t-shirts. All of them are mainly black so they don’t take stains too easily and they all match with my bright colored cycling jerseys if needed. I take three cycling jerseys as well, but if you don’t have any, just take any three shirts you feel comfortable to do sports in, as you’ll learn about your preferences as you cycle. They usually are available at some Giant or Merina store, if you get to a mid-sized city in China. I bought mine along the road or got them gifted actually. Over time I realized I prefer the style where they have a zipper up front and three pouches on the back. I think these are so handy, all shirts should have them. Three pair of socks for both on and off the bike. I only have one sports-bra that takes only one night to dry. To protect me from the sun, I wear sleeves (lot of women in China wear them, so I assume you can get them at every market) and a cycling hat underneath my helmet. Especially the hat isn’t very fashionable but it keeps me from getting funny from too much sun. For rain-and-wind protection I have a light-weight rain jacket as well as rain pants. Just make sure you can easily move your legs in them, they don’t have to be especially made for cycling. I also have one pair of sun glasses as I don’t like the brightness for my eyes very much. For China and Asia in general I recommend a filter mask that is recommended for sports. There are different brands around, just make sure it has a filter that can get exchanged. Otherwise they’re not helping much. I wear mine when the pollution gets bad but it has the down-sight of sweating badly underneath it. For washing/toiletries I have a big, ultralight travel towel, soap, deodorant, tooth-brush, tooth paste, toilet paper, nail clippers and flip-flops. Yes, that’s right. I started wanting to take like three bottles of shampoo, then actually taking one and now – none. No shampoo but long hair. If I am camping I can’t wash my hair anyway and even budget hotels would provide shampoo. The bar of soap doubles for clothes and body washing. The flip-flops are for showering and going to the toilet during the night. If you are menstruating you might want to prepare for that as well. It is possible – considering the amount of blood as well as the padding – to use the shorts during the day. As well are tampons but be aware that it’s almost impossible to buy them in China. That’s why I am using a re-usable menstrual cup out of silicone. You only need to boil it for about three minutes to be clean which is only needed at the start and at the end, before it’s stored away. Pretty much every hotel in China provides a water cooker so that’s never been a hassle. For the category of everything that needs power I have my smart phone, my laptop, my camera, headlight and a power bank. Plus, of course, chargers. For China you don’t need to bring any adapters as their outlets cater for all kinds of plugs. In case you will go to another country where you need it – get it there and then. For the first trip I didn’t bring a proper laptop, instead I had a tablet that annoyed me badly as it was neither very convenient to use nor small to pack. By now, the ultralight-pcs are fast enough and very convenient. My smart phone doubles as an e-book-reader, mp3 player and address book (yes, I took a paper address book with me on my first tour). Depending on your phone and your camera – you might as well leave your camera behind. The laptop I use for photo backup, blogging and writing for SDC. But I think that’s an individual decision. One option to save space (and money) would be to get a good keyboard to use with your smart phone. For food and drinks I have – of course – a water bottle on the bicycle. Alsp, I have chopsticks as I don’t want to use the single use ones many restaurants offer. I also pack an ultralight pot – that I got with the stove – for lunch-leftovers that I can eat as a snack or dinner. The most use I get out of my tea-pot. It’s plastic, has a lid and holds approximately 0.5 liters of water. I usually walk up to the people at the gas station, asking for hot water and therefore making the trail of plastic bottles I leave behind on my tours a bit thinner. Finally, I got my diary, pencil and sharpener. I try to write down a couple of things every day no matter how tired I am (distance, weather and places) plus taking notes if someone I meet suggests a book, an app, or a place to see. An ultralight-backpack is handy when I want to go explore the place I am at and for day tours on rest days. And then there is – of course – my passport, credit card and cash. That’s it. Many – no, ALL – cyclists in the how-to videos you find online said how they are always packing all their bags the same way. That put a lot of pressure onto me as I thought I had to figure out the perfect way to pack them even before I leave. Now, I actually don’t think you have to do that. I pack mine differently actually almost every morning. During the tour you will figure out what goes where and you probably end up only needing to take one bag if you stay at someones place. There are a few things where I think it’s important to know where they go and have them in convenient spots: toilet paper (most travelers will encounter situations where there is no time to look for it before it’s needed), emergency kit (if you fall badly, you need band aids and pain killers fast) and rain clothes (ever been caught in a sudden down pure in the middle of the road going through all your bags, getting everything wet, while looking for your rain coat?). But for everything else, don’t stress yourself out. Just see how you go and it just develops over time. For me it’s very helpful that I put things that go together into different kind of bags. I never bought any specifically for that. I got a superman-vs-batman-zipper-bag which is great to keep my tools or I have a plastic bag from buying bread in Hong Kong which holds my pens and notebook. That way I can find my stuff easier. Plus if the sun screen is in an extra plastic bag and everything else is as well, it can’t spoil all my clothes. For clothes, I want to keep dirty and clean separate as well of course. So my first “touring bicycle” I bought my bike through Craigslist for 1,000 Yuan from an English teacher. It came with panniers, lights, towels and quiet a few things more I could use when I first got to Shanghai. I checked it’s price online when I came back and it sells for about the same price new. It didn’t have anything special features for bike touring apart from gears. I bought a front rack and handle bar bag on Taobao and realized that the saddle was killing me even with padded shorts. It was a very simple bicycle. It had small wheels, v-brakes and was pretty much down with when I used it for about 9,000 km. But it actually was a perfect touring bicycle for China. A friend of mine ripped the tire of his big-sized-wheels and struggled to get a replacement as no store in that area would have anything in the size he needed. He had to call up a bicycle store in Shanghai, they would first order and then ship it to the next big city he came through and until then, he had to ride on grass that he put into his tire. If you had disc-brakes you might run into the same kind of problem. Buying a new bicycle in Germany the guys at the bike stores tested my patience. I specifically asked for small wheels and v-brakes because I knew I would go back to cycle in China and other parts of Asia again. They kept telling me not to worry as the bicycles are produced in Asia and you could get easily replacements everywhere. But they are not being sold everywhere, only in big cities. And I don’t dream of cycling in Beijing’s rush-hour but in rural, laid-back China, Burma and Vietnam. If you choose big wheels and disk-brakes just keep this in mind when planning the “repair section” of your packing. Light is another big one. Since I was once stuck on Burmese gravel roads in between fields with no chance on camping during night fall, seeing less and less with the lights my bicycle provided and getting more and more stressed out about it, I would always go for brighter. As I needed to get a new headlight anyway, I decided on one that provides enough light for cycling as well. As it blinds motorists though, I will only use it for cycling in rural areas. How to get your bike to China? Not every time I have been lucky enough to just start cycling from my living room but had to pack my bicycle on an international flight, so both of us would get to the continent where I wish to cycle. In this area there are two topics to look at: How to pack it and what to consider when choosing the airline? There are different approaches to packing your bicycle. Some just use bubble-wrap as they believe the airport-crew will go easier on it if they recognize it as a bicycle. Other would have a bicycle suit-case. I never tried the bubble-wrap approach as I worry the airline might not accept it. The bicycle-suitcase solution never appealed to me as I would spend a quarter of the bicycle price just so it’s a bit more unlikely that it gets a dent on the plane. There are two more downsides of this is. First is that you have to store it during your trip which is either asking a huge favor to a friend that happens to live there, or you pay for storage. Second is that your trip must start and end at the same place – otherwise you and your bicycle will be at another place then your suitcase or you have to send it there. Upside is that some airlines don’t consider your bicycle to be a bicycle in these boxes and you save on shipping. delivered in. Usually they would have one or get one in before I go and give it to me for free. As most planes leave and arrive in major cities it’s never been an issue for me to find a box. To know how to take apart your bicycle for the plane just go to Youtube and search for a tutorial, there are plenty. So which airline to take? This is a wildly discussed topic among cyclists. I prefer Emirates by now as they have very simple rules – take as many bags as you want (so no need to pack the panniers into a box), one of your bags might be sport equipment (e.g. a bicycle) and you can bring up to 30 kg plus 7 kg hand luggage at no extra cost in Economy. Other airlines that I looked at are more complicated – with Lufthansa neither me nor the girl at the travel agency could figure out the actual price and Finnair asks for a hard-cover-case for the bicycle. But I am sure besides Emirates there are other good options available depending, on the airlines available at your place and destination. If you don’t want to cycle out of the airport, you have different options on how to transport your bicycle in China. Most Chinese airlines don’t charge extra for a bicycle but check with the specific airline you want to go with. On the train it must be packed in a box. There is a service where they pick up your parcel from your place and deliver it to the door of your destination. For this, I suggest you either speak some mandarin or ask a mandarin speaker to help you out. Boats and ferries have been very easy for me so far as I would simply push my bicycle on and off just like every one does it with their motorcycles. Buses are easy as well – they will transport your bicycle in the luggage compartment where the suitcases go. Sometimes they charge per item so once I just chucked my bicycle with panniers and everything into that compartment. Other times you have to try to be there before it’s cluttered with other people’s luggage. In a taxi, the driver would usually help me to make it happen. If it’s in my box it fits right behind the driver and passenger seat of a regular-sized car. To take your bike on the subway it has to be in a box as far as I know. So far, I haven’t seen a city in mainland which would allow it (if you know one, please leave a comment). Hong Kong allows it if you take the front wheel off. Imagine the fun, of pushing a fully loaded touring bicycle while balancing the wheel that had to be taken off. Once on tour finding food felt much less of a worry then finding a place on sleep. But I eased into it and after finding a place every single night so far, I stopped stressing about it after the first couple of weeks. For me it’s essential to have a tent with me. If all else fails, there will be a spot where I can put it up and sleep. Even if I have to ask people to put it up in front of their house. The first night on my own I slept just at the side of the road only a few trees between me and the trucks. On the other side were fields and I could see some houses. But worse – they could probably see me, too. I was so very scared that someone would come up, that it actually took me three attempts to put up the tent and then I was too scared to fall asleep until I told myself I better sleep so I will be rested once bad people would come up to my tent. Never happened – I slept to the next morning. Another time I believed myself hidden in between some olive trees – but when I packed in the morning, friendly neighbors came around to give me a hand. So after a while I got bolder, learned from other cyclists I met along the road and set up my tent in the middle of a public parc. Factories seem to be a good place too but my mandarin is so limited, that I never bothered to ask and therefore never camped there on my own. The most lovely experience was when I met two students that were cycling home from Hangzhou to Fuzhou. One of them took me home to his place and when we arrived, his father had prepared the meal and set the table for three people; himself, his son and me. It was such a nice, warm and overwhelming feeling after cycling for two weeks that I will always remember their kindness. Apart from running into people I planned this a couple of times and stayed with people from Couchsurfing which always was a nice and pleasant experience for me. So being open-minded to the people you meet along the road can get you a long way and is part of the special experiences of bicycle touring – but of course you should never expect or depend on the help of strangers. And of course, there is paid accommodation like hotels. To find them I learned some of the characters and words for hotel so I would either recognize it or ask for it. Most people I approached where very helpful but maybe some were stressed about my Chinese level. A couple of times people actually took me to the hotel as I didn’t understand the directions. Pretty much every town would have a basic hotel. If you get to bigger cities you start having a choice. For finding a hotel have a look at the app-section. As a conclusion, even traveling alone, I never had any troubles during the nights apart from mosquitos. I dare to say that the worst thing that could happen to you during the night is falling asleep in your cycling pants, as this might give you a rush or infection. China is a cyclist paradise when it comes to food. It’s available everywhere, it gives you lots of energy and as far as I am concerned – it’s so so yummy! So finding food in China is extremely easy as everyone has to eat and it seems quite common to not eat at home and – depending on the region – anytime of the day. I got to Beihai at midnight by ferry – and stopped by a roadside barbecue place on my way to the park where I planned to camp. But you should be prepared to eat local and not western-style. In the morning, made-up-restaurants on the side-walk and hawkers will sell their merchandise on the middle of the street. For up to five Yuan I would get myself a cyclist-amount of breakfast most times containing of sweet baozi, noodles or savoury pancakes and fresh soy milk. Most times there are enough restaurants around that you will get passed at least one if not a dozen around lunch time. The nicer the restaurant looks, the pricier the food is. Most times I would choose one without real doors and without air-con. A couple of times I would be asked to point towards the menu to choose what I eat despite me explaining that I couldn’t read. In these cases, I would pick a couple of cheap dishes hoping it would be vegetables and not something special like pig stomach. Most times I was led towards the kitchen or a fridge where I would point to food that looked good to me. A few minutes later, I was served a couple of fried dishes and rice. Ah – that’s the best thing ever for a cyclist. As much rice as you can manage to eat! For dinner I would sometimes just have lunch left-over that I packed into my pot or noodles if I could get hot water. Another option is to stop at a night market before you camp. If you miss western food too much, you might go to one of the mock-up fast-food restaurants that many cities have. I have been very lucky when it comes to food poisoning by following one simple rule “If I don’t feel good about eating it, I don’t eat it”. The smaller and the more make-shift a food place is, the more insight you get into their food preparation. You can see and judge the food – especially the meat – pre-cooked and see how it’s being cooked. In China it’s rather unusual to eat raw so most times the food that is being served has been freshly cooked or fried which adds a lot to food safety. So, my advice, when it comes to food is: look how they prepare the food and go to places where many people eat. They need regular customers to maintain their business which they don’t keep when their food hygiene is too low. Be brave. Go to the markets. The small stalls. And enjoy! To deal with the extremes in weather, electrolytes are not wildly available in stores in China. If you know you are going to cycle in the heat, bring some from home or get some salt to put in your (sugar) coke. If it gets cold, hot water is wildly available and safe to drink. If you plan on wild-camping, this is always an important issue. In China, there are plenty of public toilets – it’s really an upside of park-camping. I would go there to wash myself at the sink – I actually have vivid and good memories about the joy of coming across well-maintained public toilets. For wild-camping I would dedicate about half a liter of a water to wash myself using a part of my towel. To get the dirt off, without needing too much water, is making it wet, scratch and scrub until the dirt is loose, and rinse it off. When it’s dry at night, I would hang my clothes onto my bike in a way to air them a bit so I could put off the next time they need a wash a bit. Actually wash them, I would at the sink at the hotel or washing machines of hosts places. A night with air-con is usually enough to dry your clothes. Distance to go per day? That’s one of the most frequently asked questions. Most times I – and many other cyclist – cycle 100 km per day as this is a distance you can normally manage to do. A better rule of thumb that helped me when I couldn’t find out about the road conditions, up and down-hills is to see how far a car get’s in one hour. They get slowed down by similar stuff as I do as a cyclist be it bad road conditions, hills or many traffic lights because it goes through a city. How to choose a route? When it comes to choosing a route from A to B you have to take in different criteria according on how you like to cycle. Unless you are in the mountains. Then there usually is only one road which you can take. But if you CAN choose – and most times you can – you have to ask yourself: what do you prefer? Good road conditions but trucks? Smaller roads, fewer trucks but not so good pavement? Many turns or do you rather just go straight? Do you want to take the road through or around the hills? And which option might be more scenic? For China there are three types of roads you should be aware off that all offer different advantages and disadvantages which I will go into in the following part. Red G-Roads have generally good conditions as they are financed by the government. Wide shoulder, which you will use as they also come with heavy truck traffic. They tend to lead you around towns. The green G-roads are bicycle-free highways. Roads on province level. They are somewhere between the G and the X-roads. Small roads on county level, conditions may vary. You might be lucky with great pavement or unlucky with potholes and maybe even dirt-roads. They also have the habit of disappearing. A couple of times there was a factory or a newly build housing area where my X-road was supposed to be or it would just lead past some houses, getting smaller and all of a sudden there were only fields and paths. Their smallness is also an advantage as they lead you along houses and through small villages and have by far the least traffic. On these roads you are the most likely you get lost – depending on your style of travel this can be an advantage or disadvantage. These are scenic roads especially built for cyclist like the Guangdong-Greenway. It’s usually a lovely, very scenic net of bicycle lanes some places would even supply information, places to rest and more. You will cycle past rivers, along trees and don’t have any traffic to deal with. Problem is that you can never know the condition. One part might be lovely and maintained, but then it’s falling apart, you have to cycle past roots or get off the bicycle at every crossing as they put heavy-duty blocks up to ward off motorbikes. And if these intersections are every 200 meters or so you quickly grow tired of that. Information online seems to be scarce about these routes – even in Chinese. I usually learn about them by stumbling across them. Road conditions can very by far. I have been on S-roads that had two lanes, nice shoulder, excellent pavement and I’ve been on G-roads where there was just one lane each direction and zero shoulder. In general, with the G-roads you will get the best road-conditions this area has to offer and then they are going down from there. You will also get the most leveled roads and the most tunnels in the mountains. Speed-bumbs can get extremely annoying – sometimes they are every 20 meters for km on end. So make sure you’re panniers are well fixed to your bicycle. If you want to know more about a certain route, check this website to see if someone did it before and wrote about it. I found them extremely accurate and helpful. The good news about the people you are sharing the road is, is that no-one is out to get you (like some European drivers that like to teach you a lesson when you didn’t follow all traffic rules in their opinion). On the other hand, no-one is going out of their way to not hit you. You are responsible for yourself way more than in other places. The traffic in China is very different to other places outside of Asia. Even so I’ve cycled way more than 10,000 km in China and South-East-Asia so far, I always need a moment to ease back in. Give yourself some time to get used to it and to get to know it. Don’t insist on rules or behavior you are used to from other places. When you are in a taxi, sit in front and watch the traffic, see how people are finding their way around each other. Go for walks and become part of the traffic. Cross the street with other pedestrians, see how they deal. Watch the motorcyclist closely. When cycling, you can move around and will be treated much like them. Don’t go around cycling being too slow and careful but not to bold either. Try to follow the example of motorcyclists when it comes to wait for green lights and crossing roads. If I was waiting for gaps the size I am waiting for back home, I wouldn’t have a fighting chance to ever cross but of course I don’t want to be run over either. Going on the sidewalk with the bicycle isn’t a good option either. In big cities they lead pedestrians towards bridges at intersections, get fenced up from the road hundreds of meters before to prevent anyone rather walking across the street. So as a cyclist you end up having to go back or carry your bicycle across the bridge. Trucks will pass you extremely close. The idea of a safety zone doesn’t exist in China. The load floor of a truck will be right next to your head at some points of your journey and you will feel how they are moving the air. Cars and motorbikes can turn right at any time, totally independent from the traffic lights or pedestrians crossing. If they turn into or off the road it’s up to you not to hit them. Furthermore, the traffic is rather noisy. Cars beep, public cleansing service plays the melody of “Happy birthday” and the horns of the trucks play a melody that hurts your ears. And everyone is honking. All the time. Sounds annoying? Try to embrace it – this way you always know where everyone else is. Listening to music through my headphones helps me deal with the noise at some times be safe(r) on the roads I always wear a helmet. I also prefer bike touring – where you have panniers on the side of your bike – to bike packing – where you are more streamlined by packing your things into the frame. Having wide, red bags helps being seen. Warning triangles aren’t wildly used. Tree branches are letting you know about a broken down car in front of you or that a road is closed. To be safe on the roads I always wear a helmet. I also prefer bike touring – where you have panniers on the side of your bike – to bike packing – where you are more streamlined by packing your things into the frame. Having wide, red bags on the side helps being seen. Construction sites can be annoying and they can be a blessing. Most times they are long, for many many kilometers. Once I had to cycle into a town through kilometers of road work just to learn the next morning that it continued on the other side of the town as well. Have a look what the motorcyclists do, look down the construction site and see how construction workers (if there are any) react to your being there. Many times could I just cycle along the blocked road while the bigger vehicles where on the other site. Other times I just had to go where everyone else was. I used to be scared when they came. If I would see one in the distance, I couldn’t help but fearfully stare at it, anticipating how it would come run towards me, follow me, run around my bicycle, bark and totally freak me out. And of course they did. Because I stared at them. They never tried to bite and grew bored with chasing after me pretty quickly. I learned to ignore them and since I do that, they are not at all interested at me and just kept minding their own business. If you get into an area where dogs chase you, try not to pedal when you are getting closer. That way, you just appear like a motorcyclist to them to which they are used and probably they don’t bother to get up. If you have a head wind or are going up hill, this isn’t an option. Try not to change anything about how you do it. Keep your positions, keep the gears and keep the speed you are moving your legs. This way, they get bored easy as well. Guarding dogs will run after you and bark but many times not really try to overtake you. They only want you gone out of their comfort-zone which ends soon after their owners plot of land ends. The above said goes with dogs that most-likely belong to some place. The situation with feral dogs is different. If you are going towards Tibet you encounter packs of wild dogs that might or might not have rabies. In these areas cyclists tend to carry a stick or some stones to threaten and/or hurt the dogs. If you think this sounds cruel – it’s for situations where it’s them or you. If you do get bitten by any animal – cat, dog, bat… – go and get rabies-vaccination. I got the shots back home – that gives you a 50% chance of not getting it. So I would still go to make sure. Rabies is common in China and it’s a disease that is 100% deadly if you don’t get vaccination before you start getting symptoms. Before I started my first tour hills where my deepest worry. I grew up in flat land and most places I ever cycled where flat. I was sure, I wouldn’t be able to cycle hills so I searched for the flattest route possible. But of course I had hills. And at first, I hated them. They made me go slow. They cost a load of energy – of my body and mind. But then I realized that “for every up hill, there is a down hill” or, to put it with another cyclists friends words, “It’s like you are charging a battery: with every meter you go up, you store energy that you will get back once the downhill comes”. By now, I simply accept the hills, look forward to the down hills. It’s awesome if you roll down and speed up to 45 km/h without using your legs. On the plus side, hills offer the best views. Head winds are way worse than up-hills – for your body and mind. They make you slow, they seriously steal your energy, get your morals low and you won’t get rewarded. If you realize you are going a way where you are going to have prevailing head winds for a long stretch, try getting up early in the morning. Winds pick up during the day and slows down in the mornings. Going alone? Or with a friend? Or even a group? That’s totally up to you. I cycled alone and in groups of two. I enjoyed both as both has his pros and cons. I laid out many of the pros of solo traveling in this article about female solo traveling, and many of them apply to cycling in China as well. Cycling and bicycle touring becomes more and more popular with Chinese people. So depending on time and place you might run into other cyclists and you might agree on cycling together for a bit. I always enjoyed that. Of course this always comes up. It’s an issue, depending on when and where, it’s more or less bad. You can check it on different apps but most times you can actually tell how the air quality is. If it get’s too bad, I wear my filter-mask. Garbage is being burned at night fall in many places. So when looking for a place to camp I try to make sure it’s not too close to that. You are your own transport system. You don’t have to go through the hassle of buying a train ticket, finding out where the bus leaves or haggling with the taxi driver or dealing with the problem of even finding a taxi. wherever you go, it just depends on you know. So in these ways, it’s kind of easy. You will leave the beaten path and end up in places, where not so many foreigners go to. To gather information about these places, look online – chances are they aren’t covered in your guide-book but here on SDC. You will get to experience nature outside from designated, landscapers tourist areas. If you plan to use paper-maps only you can skip the maps-card of this section. Just be aware that it’s not easy to get maps in China. Usually maps for one province are only sold in that province; maybe in a town close to the border you can get them for the next province. Sometimes book stores have them, sometimes supermarkets but you will always have to look for them. Most of them are not very detailed and I never had a choice of different maps. That’s why I gave up on using paper-maps in China even though I liked the additional help for getting an overview of where I was headed plus they never get into any technical difficulties, crash or run out of battery. It helps a lot for navigating, if you remember the characters of the places you are headed too as PinYin fades out of road signs if you leave the cities. Google maps has been banned from China since 2014 so therefore it’s getting more and more outdated. Streets are being moved, rebuild and hotels closed down. The smaller the streets are you try to follow, the more likely it is in failing you. Even on my first tour in China in 2015 it led me into dead ends displaying them as a through-road. It’s convenient though as it’s completely in English. As there is no cycling mode for China, I use the walking one – approximately the distance that could be covered in a day walking, can be covered when cycling. It’s very good to get an overview of where to go and a good idea about the distances between places. OpenStreetMaps relies on people contributing to it otherwise it doesn’t know the streets, hotels, restaurants… and there isn’t that much information going on so far. Many times if I used an app relying on OpenStreetMaps, it would send me twice the distance. Specialized hiking and cycling apps often use OpenStreetMaps as well. Depending on the region it’s helpful to find out the inclination you would cover and consider that in as well. It was very helpful in Hunan and not at all in Jiangsu. So always double-check the route with another app. So far, it’s the most reliable app I came across for navigating in China. It is complete, mostly up-to-date and has additional information such as tourist spots, restaurants and hotels. It even has a cycling and a walking mode which are very convenient. Don’t be taken back by the fact that it is only available in Chinese. It uses a lot of pictures so you can find your way around without chinese reading skills. I usually check the map, figure out the distance until the next turn off and cycle until I get there. It’s just unbearable to listen to (like I would do with google maps through my ear phones) as it keeps talking to you. None of your friends is using WeChat so why should you install it? To make new friends along the road. A couple of times I and my cycling partners got filmed or photographed by random people along the road. Walking up to these people, smiling and asking for their WeChat gave me the opportunity to get these pictures – and it’s not that easy to get pics of yourself or all of your group cycling, so I really appreciate that. Don’t worry about this part if you don’t speak Chinese. Show your phone, open the app and go to the “QR-Code-Scan” section. WeChat has a translate – option as well where received messages can be translated into the language of the phone. In my experience the most convenient app for hotel bookings and to find a hotel in China. They know much more hotels around China than other, more western-orientated, apps and have lower prices. But even if they don’t show any hotels in a town, there still might be one, two or a dozen. I met a few nice, helpful, welcoming people through Couchsurfing that would host me for a night or two. It’s a great way to get into touch with people especially if you don’t speak Chinese yourself. So, not only for these situations, a reliable VPN makes your life and cycling a lot easier – despite what I said about google maps before. All reliable navigating apps need an Internet connection to work and I wouldn’t like to rely on finding a Wi-fi any time I needed it. A Chinese SIM card makes live easier on this point as well. Check out this article for more information on this topic. If you are ready for an adventure, splendid landscapes, heavy trucks and people watching you close by and delicious food – go for it! You have a complete guide here and – most stuff you didn’t plan for will eventually fall into place. Somehow, everything works out for me on my tours. I try to be prepared of course and not to rely on other people helpfulness if I could have done it myself and never expect anything from strangers. But I encounter many helpful and curious people and eventually, everything always falls into place. When I couldn’t remove my back wheel due to rust, someone helped me out with a bigger tool. When I needed my back rack replaced, a helpful cyclist showed me the way to the bike store. And when I desperately needed a place to rest, I would find a nice spot. By now, I am totally hooked on cycling in Asia and going on my first tour was one of the best things I ever did. 5-months after starting out so very stressed out, I came back happy, strong and full of self-esteem – and could even fix a flat tire. Neela just wanted to leave her comfort zone when she left to work in China in 2014. But then, if it's possible to fall in love with a country, she fell in love with China and admires South-East-Asia as well. Whenever she can, she goes back to travel new places and deeper explore the ones she already knows in China and South-East-Asia. While traveling she is likewise writing about it on Naiveorbrave.com.